Probably not the publicity Tesla needs right now as the Model 3 enters production. You would think Tesla’s electric cars are among the safest in the world. The Model X was recently awarded a five-star safety rating in every category from the NHTSA, making it the only SUV to receive a top rating from the government organization. It was a similar story for the Model S, which was hailed as the safest car the NHTSA had ever tested. The Insurance Institute for Highway Safety disagrees, however. 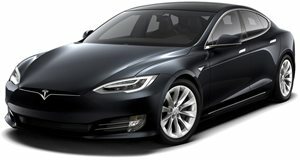 New crash tests carried out by the independent organization revealed that the Model S may not be as safe as Tesla claims. Back in February, the Model S received an “acceptable” safety rating in the small overlap front crash test, which simulates a crash between an object and the front corner of the car, because the seat belt didn’t stop the dummy's head from slamming into the steering wheel. Tesla has since improved the seat belts and is expected to be awarded the Top Safety Pick+. Despite the changes, the Model S still received an overall “acceptable” rating as the same problem happened when the IIHS re-evaluated the EV in two separate crash tests. Furthermore, in the second crash test maximum intrusion into the driver’s space increased from two to 11 inches in the lower part of the cabin. The corner of the battery case was also damaged, but it wasn’t in an area that contained battery cells. Tesla argued that the IIHS has “methods and motivations that suit their own subjective purposes” and that it considered the US government to be the “most objective and accurate” organization to test a vehicle’s safety. Still, it's not ideal publicity as the Model 3 is about to enter production. Even an amazing electric car still has the problems of a normal electric car.